It’s been a very long day, since neither of us got a whole lot of sleep on the red eye on the way over here. Jocelyn keeps referring to things in Amsterdam as if they happened “yesterday,” though we’ve only been in the Netherlands for 14 hours. Suffice to say that we’re even more tired than we were this morning. After breakfast at the Toussaint Cafe, where we received the keys to our apartment, we came upstairs for a much-needed nap. 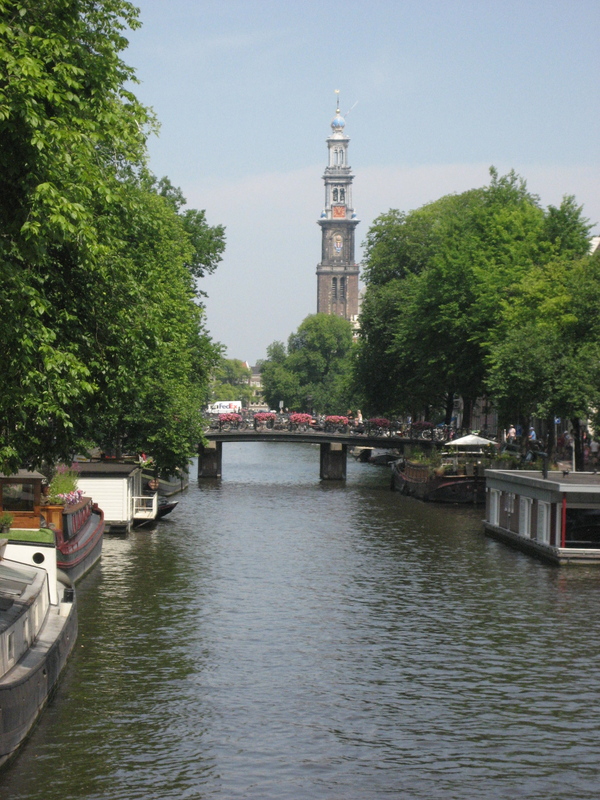 It’s a cute place, a one-bedroom apartment right on a small canal in a neighborhood called the Jordaan. 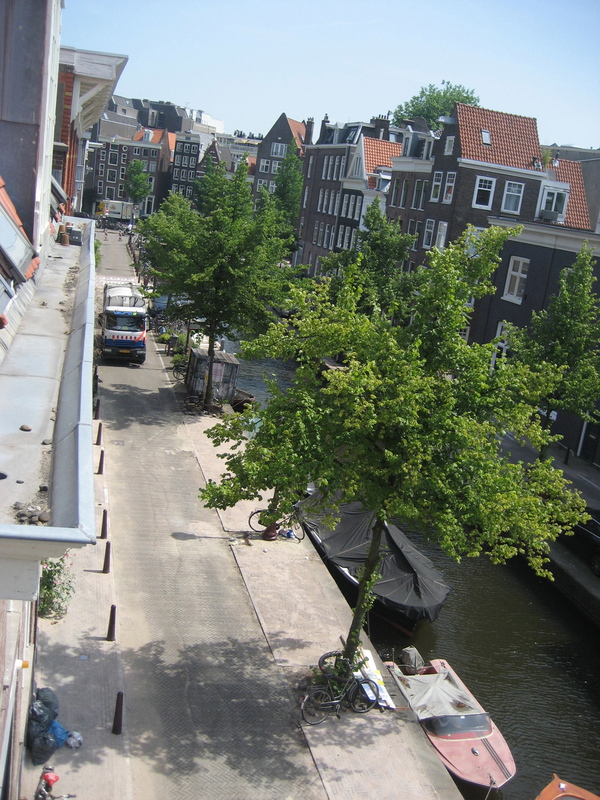 This is the view down the street (not great in the mid-day light) from our apartment. Then we went out and wandered the “9 Streets” area, a part of town very close to our apartment filled with fancy shops and elegant canals. Great clothes shopping! The cheese shops here are amazing! 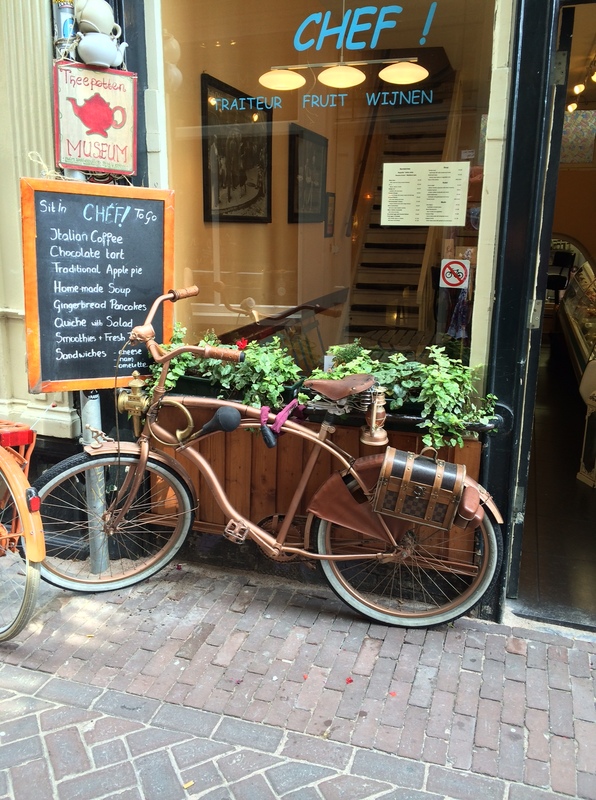 And they have so many bikes, some of which are truly remarkable. J and I basically walked until we thought we might fall over from exhaustion, and then we walked some more, and then we finally cured our dehydration with iced tea at a lovely cafe. 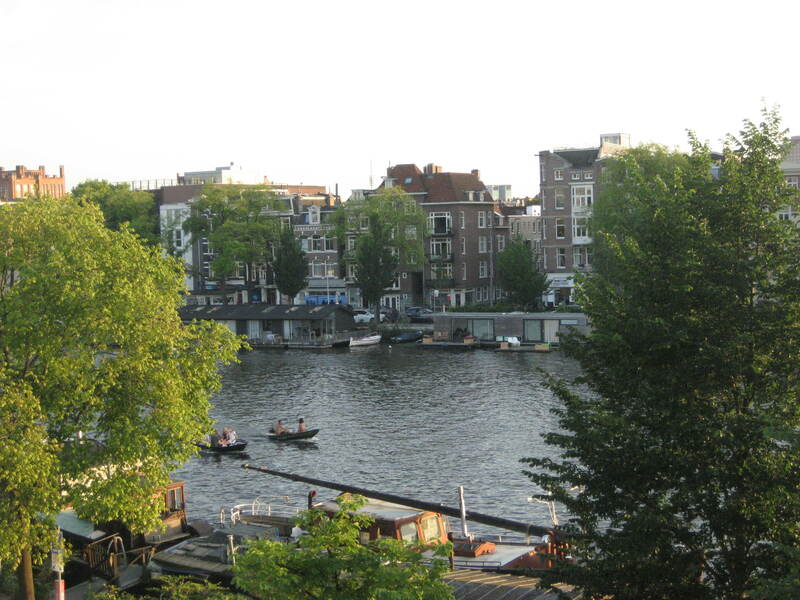 Finally returned to the apartment for a brief rest before heading out to meet one of Tina’s old students, Max Streuver, in the Oost District of Amsterdam. We rode our bikes out, which at first felt like taking our lives into our own hands bikes share the road with scooters and pedestrians, and sometimes with cars, and it’s not always clear who has the right of way at which points). But once we started getting the hang of it, we really enjoyed the ride. 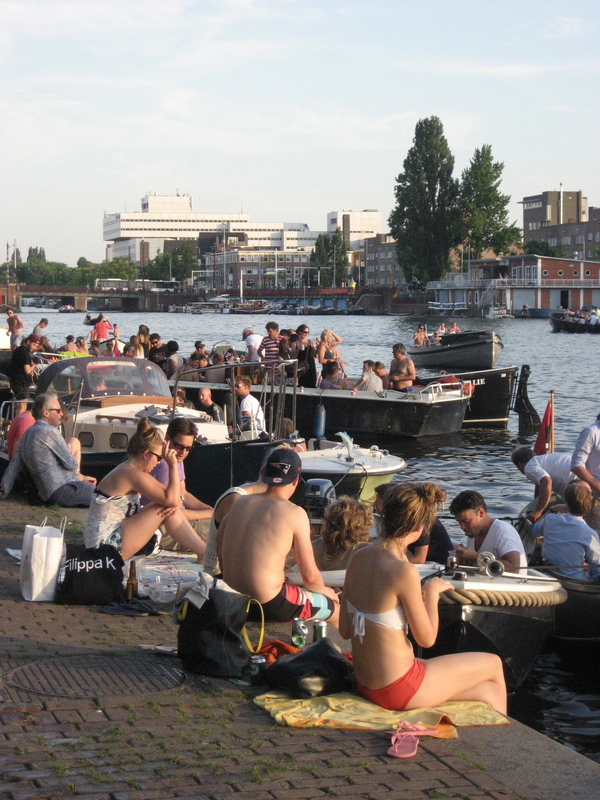 It was a gorgeous day, and it looked like everyone in Amsterdam was out sitting by the river, having picnics, going boating, and sipping drinks in cafes. 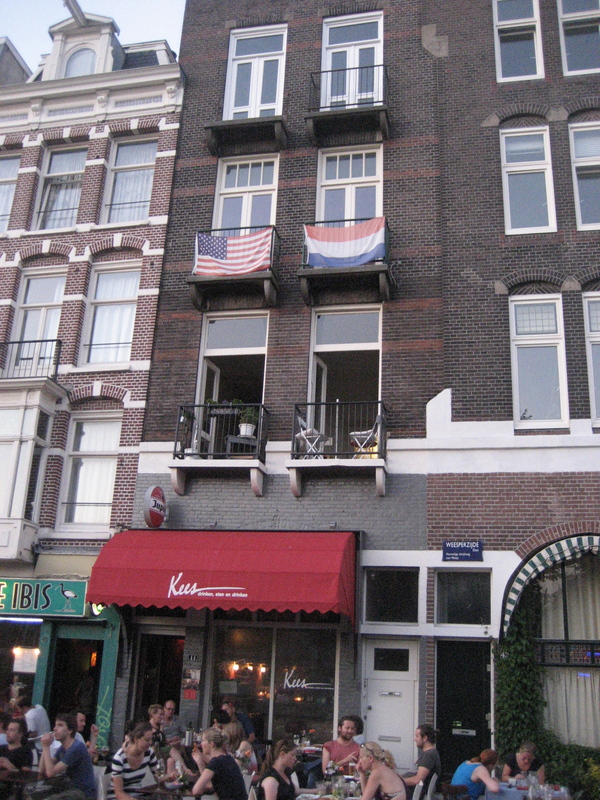 Max showed us his apartment (a 25-year-old’s version of a very cool frat house — it’s the one with the Dutch & US flags). Then Max went off to a roller-blading event in Amsterdam Centrum, and J and I had dinner at the Eetcafe Ibis, which had outsanding Ethiopian food. After wolfing down our food, J and I biked back home — and now we’re excited to head toward bed! 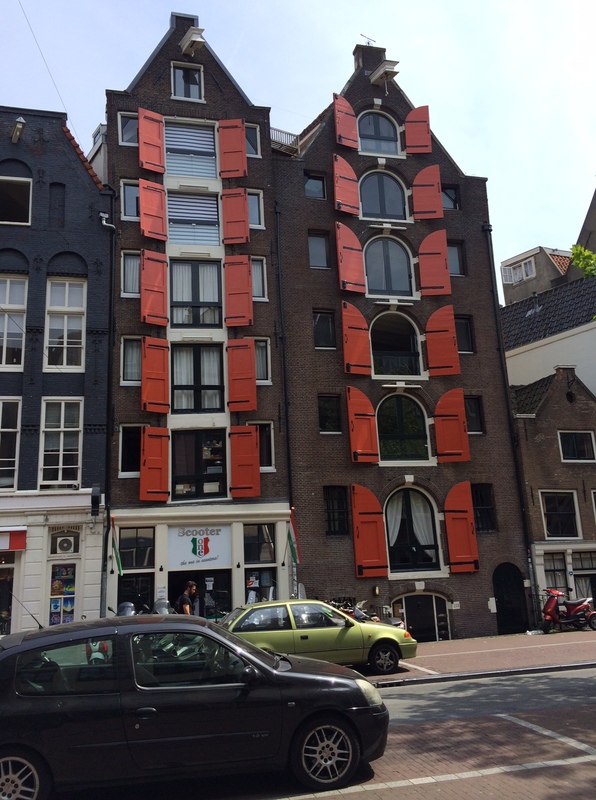 ← Made it to Amsterdam!